the scent of green bananas: imbb 13 pt. 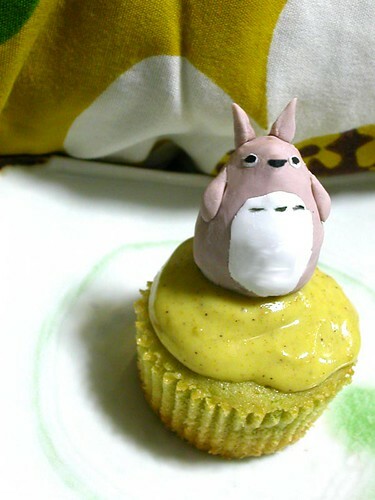 1: matcha cupcakes with pistachio cream and totoro "truffles"
Posted by santos. This entry was posted on 20050324 at 1:11 AM You can skip to the end and leave a response. Yum! These look totemo oiishi desu yo! Omigosh it is *too* *too* cute to eat! Who is that creature (that's not Pikachu after cosmetic surger is it? :) and what is he made of?
! !totoro is soo cute! I especially like the second one who looks caught in quicksand. Excellent! I am so glad I found your blog. I love matcha everything. I will definitely try those cupcakes. I was gonna make green tea icecream this weekend, but maybe I'll try the cupcakes instead! 14 hours and I'm still speechless. Yer like Pinkcocoa, she like matcha too.. and made some..;) Yums..!! and i love pistachos.. ;) they are my absolute.. absolute favourite..! OMG, chouuuu kawaiiii!!! 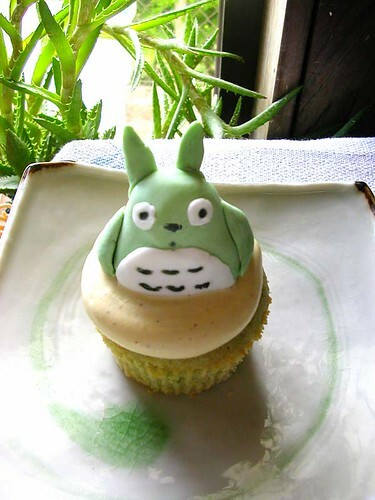 I love the totoro that looks like it's sinking into the sumptuous cupcake! whoa!! those sound delicious and look so incredibly adorable!! i love totoro..the figures you made look great. "Waiter! Oy, waiter?! 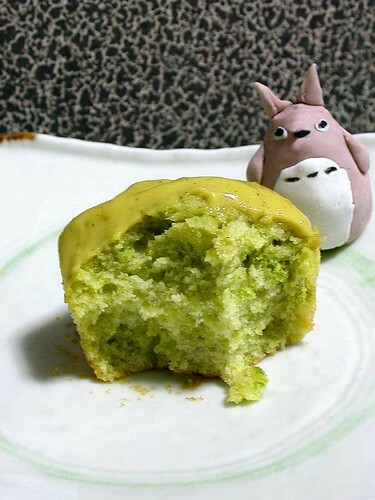 There's a totoro stuck in my muffin!" As always Santos, a completely unexpected combination of flavors (to me anyways!) and yet, it just seems as nothing has ever been more right! YUM! I want a totoro, I want to take him home. hannah--let me know how the cupcakes turn out for you! mrs.t--thanks for the tip about pinkcocoa's cakes, they look great! pistachios are great, aren't they? pinkcocoa--i used both, but these didn't turn out very strongly matcha-ey, i think because of all the butter and the eggs. also the tea i used was rather mild. i didn't want them too strong because i was afraid they would be too bitter, but i don't know if these were strong enough. emily--thanks for dropping by, i love these little guys, they were fun to make. zarah--(laughing) i'm waiting for the day i can say that to a waiter! hi stel--these were pretty good, and the flavours subtle, i the kids will like them too. totoro, i would! they were so much fun, i want to make dozens of different ones. Hi Santos - I'm not familiar with matcha, but I'm sure these are delicious - they sure look to be in any case! Your totoros are so cute! I was just visiting Maki's blog (she also used fondant) and am so wanting to play with some fondant of my own!!! I so know what you mean about too many recipes. If I were to make one blogger's recipe a week, I'd still never try them all! what's a good matcha powder you'd recommend? obsessive me wants to try this ASAP. THANKS for this lovely totoro cupcake...my kids swoooooned. i've got this lined up to bake after something with wattle seed which i just got...also, did you make the pistachio paste? hello stel! i used a japanese brand with absolutely no english writing on it, so i don't know what it is! i think, though, it might be a koicha powder as it was very, very mild. i suggest that whatever brand you get, make a cup of tea with one teaspoonful of it before you use it in the batter, just so you have an idea of how strong it can get so you can kind of judge what it might be like. the pistachio paste is made by american almond products, and you can buy it at king arthur flour. it's a little pricey, $12 for 15 oz., but a can will last a very long time as you only need a few tablespoons. in fact, you might just want to use the accidental hedonist's recipe as you don't really need all that much. good luck! let me know how it turned out! Santos, the cute factor of your cupcake is out of sight! Great job on the Totoros! hi viv! thanks for stopping by. i had great fun making them. Hi Santos - sorry for the late reaction, I haven't visited your site for a while and missed all of your great creations! It's funny because I just made a post about matcha, I'm glad you like it too. Your totoro looks really sweet! hi keiko! your matcha pannacotta sounds lovely! hi judith! matcha is a type of powdered green tea. hello kirsten! that is equal parts of mascarpone cheese mixed with pistachio paste, and thinned with a little creme fraiche so it was easier to spread. I was looking around blogland for some info to add to my sitehttp://tummy-tucks.wise-owl-ebooks.com when I came accross your blog, very nice effort. I know what I like and I like it. Man I love that Totoro! I would love to see the Catbus as well! Those are the most awesome cupcakes I've ever seen! I love totoro!! My fave anime ever! I HAVE to invite my Japanese friend over to try this in my new matcha coloured bedroom come tea room. How did you get the black details on your Totoro? That is sooooo cool! I luv Totoro!!!! Thanks for the recipe and tutorial. Your cupcakes are beautiful. I love the flavor and Totoro. My Neighbor Totoro is one of our family's favorite movies. You did a wonderful job on making them.